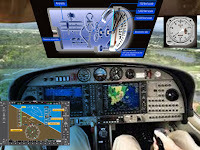 Aircraft instruments are the means of supplying the pilot with information about the aircraft and its operation could be useful and lead to safer flight. They provide reliable, accurate & continuous information to the pilot by means of direct reading on dial with pointer or with the help of counters and also provides certain information/warning by means of audio and visual signal. instrument systems now exist to provide information on the condition of the aircraft, engine, components, the aircraft’s attitude in the sky, weather, cabin environment, navigation, and communication. The ability to capture and convey all of the information a pilot may want, in an accurate, easily understood manner, has been a challenge throughout the history of aviation. 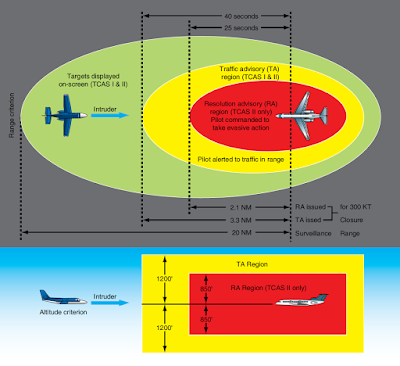 As the range of desired information has grown, so too have the size and complexity of modern aircraft, thus expanding even further the need to inform the flight crew without sensory overload or overcluttering the cockpit. As a result, the old flat panel in the front of the cockpit with various individual instruments attached to it has evolved into a sophisticated computer-controlled digital interface with flat-panel display screens and prioritized messaging. The relaying of important bits of information can be done in various ways. Electricity is often used by way of wires that carry sensor information into the cockpit. Sometimes pneumatic lines are used. In complex, modern aircraft, this can lead to an enormous amount of tubing and wiring terminating behind the instrument display panel. More efficient information transfer has been accomplished via the use of digital data buses. Essentially, these are wires that share message carrying for many instruments by digitally encoding the signal for each. This reduces the number of wires and weight required to transfer remotely sensed information for the pilot’s use. Flat-panel computer display screens that can be controlled to show only the information desired are also lighter in weight than the numerous individual gauges it would take to display the same information simultaneously. An added bonus is the increased reliability inherent in these solid-state systems. It is the job of the aircraft technician to understand and maintain all aircraft, including these various instrument systems. Accordingly, in this page, discussions begin with analog instruments and refer to modern digital instrumentation when appropriate. There are three basic kinds of instruments classified by the job they perform: flight instruments, engine instruments, and navigation instruments. There are also miscellaneous gauges and indicators that provide information that do not fall into these classifications, especially on large complex aircraft. Flight control position, cabin environmental systems, electrical power, and auxiliary power units (APUs), for example, are all monitored and controlled from the cockpit via the use of instruments systems. All may be regarded as position/condition instruments since they usually report the position of a certain moveable component on the aircraft, or the condition of various aircraft components or systems not included in the first three groups. The instruments used in controlling the aircraft’s flight attitude are known as the flight instruments. 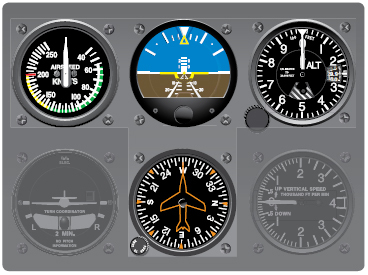 There are basic flight instruments, such as the altimeter that displays aircraft altitude; the airspeed indicator; and the magnetic direction indicator, a form of compass. Additionally, an artificial horizon, turn coordinator, and vertical speed indicator are flight instruments present in most aircraft. Over the years, flight instruments have come to be situated similarly on the instrument panels in most aircraft. 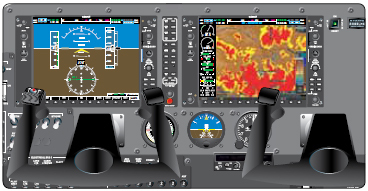 This basic T arrangement for flight instruments is shown in Figure 2. The top center position directly in front of the pilot and copilot is the basic display position for the artificial horizon even in modern glass cockpits (those with solid-state, flat-panel screen indicating systems). Engine instruments are those designed to measure operating parameters of the aircraft’s engine(s). These are usually quantity, pressure, and temperature indications. They also include measuring engine speed(s). The most common engine instruments are the fuel and oil quantity and pressure gauges, tachometers, and temperature gauges. Figure 4 contains various engine instruments found on reciprocating and turbine-powered aircraft. Figure 4. Common engine instruments. Engine instrumentation is often displayed in the center of the cockpit where it is easily visible to the pilot and copilot. [Figure 5] On light aircraft requiring only one flight crewmember, this may not be the case. Multiengine aircraft often use a single gauge for a particular engine parameter, but it displays information for all engines through the use of multiple pointers on the same dial face. To understand how various instruments work and can be repaired and maintained, they can be classified according to the principle upon which they operate. Some use mechanical methods to measure pressure and temperature. Some utilize magnetism and electricity to sense and display a parameter. Others depend on the use of gyroscopes in their primary workings. Still others utilize solid state sensors and computers to process and display important information. In the following sections, the different operating principles for sensing parameters are explained. Then, an overview of many of the engine, flight, and navigation instruments is given.